Makisha has a beautiful smile and a big heart, but as a double-cornea transplant recipient, it is her eyes that tell the story of her life. At just ten years old, Makisha was diagnosed with sarcoidosis, the growth of tiny collections of inflammatory cells in different parts of the body. The disease caused skin lesions and inflammation in both of Makisha’s eyes, resulting in severe cornea scarring. Told that she was unable to receive a corneal transplant due to her condition, Makisha’s vision continued to deteriorate over time. “I need your eyes” became Makisha’s phrase to let her three young daughters know that she required help when her own eyes failed her. The girls aided with cooking and grocery shopping. They would read their homework assignments aloud to Makisha and assist with locating things that she could not see. Unable to work herself, Makisha’s father stepped in to provide for her family. 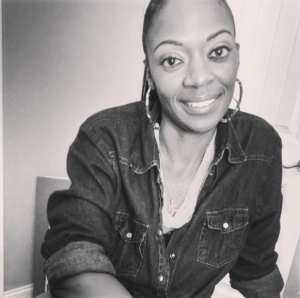 Makisha had just begun coming to terms with her situation, when she went to another ophthalmologist for the second opinion that would ultimately change her life. After learning that she was, in fact, a candidate for corneal transplant, Makisha underwent surgery and received two new corneas. Today, Makisha has a job doing something she would never have thought possible before her transplant — reading. She works as a reading assistant helping students in need of one-on-one coaching. Having missed out on doing this with her own children for many years, Makisha’s work is incredibly meaningful to her. Sadly, Makisha’s father passed away not long after her she received her life-changing transplant. During her family’s time of sorrow, Makisha found great comfort in knowing that her father was able to donate his corneas to help others in need. She and her daughters have now become passionate donation advocates, volunteering and speaking at donor registration events.